Every good deck starts with a firm foundation. 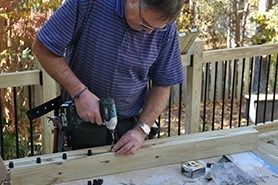 When building your deck, you’ll need several bags of concrete to create the footings, walls, and piers to support your deck. This concrete calculator gives you the built-in formulas you’ll need to help you calculate how many bags of concrete you will need for deck footings, supports, walls, pads and/or patios. From there, you’ll be able to plug in your specific project measurements to find out just how much concrete you’ll need to get the job done. In addition to calculating how much concrete you’ll need, you can also use this page to learn more about the basics of working with concrete, cost, and some simple calculations. Ready? Let’s get started! What's the Difference Between Concrete & Cement? The words “concrete” and “cement” are often used interchangeably, however, they are two very different things. Concrete is a mixture of cement and other items, such as sand or gravel. Cement is an ingredient in concrete and is the “glue” that helps hold the mixture together. Once concrete hardens, it can be used to create stairs, sidewalks, landing pads, or other solid surfaces, as well as footers for decks. Get a permit. To make sure your project is compliant with local rules, check out local building codes and obtain a permit before breaking ground. Then, call an inspector to be sure your project is up-to-code before getting started. Required thickness for footings. Concrete footings typically have a required thickness of 6” to 10”. If you’ve done your homework and checked your local building codes, you’ll be able to find out how thick your footings need to be in order to remain compliant. Just add water. Bags of concrete come pre-mixed, which means you simply add water and mix it in a wheelbarrow or portable mixer. Once mixed, all you need to do is pour it into various forms to create patios, footers, or walls to lay a foundation for your deck. Buy a little extra. We recommend buying slightly more concrete that what you think you need in case you make a mistake with calculations, accidentally spill or add too much water to the mixture. Having extra concrete mix on-hand can help prevent project delays or having to run out and purchase more if you find you need more concrete than you originally thought you’d require. Allow time to cure. Give your concrete approximately 24 hours to set before you attach the post base or install the weight of the posts. How Much Is a Bag of Concrete? Typically, concrete is sold in pre-mixed 60-lb. and 80-lb. bags. Most 60-lb. bags of concrete have a retail value of between $3.10 and $3.50, although you may be able to buy it cheaper in-bulk. An 80-lb. bag of concrete can cost between $3.50 and $4.00 per bag. However, you may be able to find it on sale for $3.00 or under, or get a discount if you purchase it in-bulk. How Much is a Cubic Yard of Concrete? One 60-lb bag of concrete gives you .45 cubic feet of concrete when mixed with 2.5 quarts of water. In order to have enough concrete for 1 cubic yard (27 cubic feet), you’ll require 2.2 bags of 60-lb concrete. Since bags are only sold in whole (not half, or quarter) quantities, you’ll need to purchase three (3) 60-lb. bags for one cubic yard. One 80-lb bag of concrete yields .60 cubic feet when combined with 4 quarts of water. If you’re purchasing 80-lb bags of concrete, you’ll need 1.66 bags of concrete. As before, since bags of concrete are only sold in whole quantities, you’ll need to purchase two (2) 60-lb. bags of concrete to form one cubic yard. Still planning your deck? Check out our deck planning resources to make sure you have everything you need.